Mineski has announced an open registration for the Mineski Pro Gaming League Southeast Asia Season 7 (MPGL), which started late last night and will close at midnight tonight. The Malaysian qualifier for the league starts at 1pm tomorrow, with a US$50,000 (about RM183,000) prize pool there isn’t much time for teams to get in on the action. 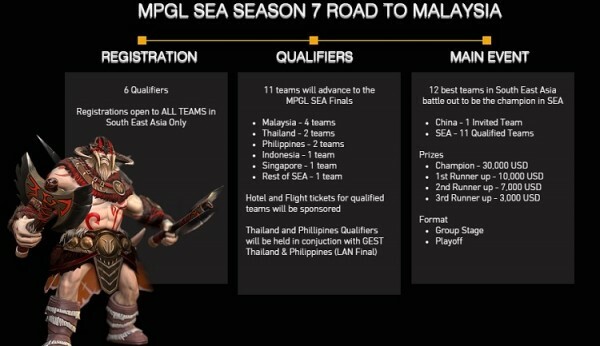 The MPGL gathers teams from all around the Southeast Asia region, and will end with a grand finals held in Selangor, Malaysia. Some 11 teams will make the cut, with Malaysia contributing the largest portion of players. Four teams from Malaysia will be selected from the qualifiers, and they will be joined by two teams each from Thailand and the Phillippines. While Indonesia, Singapore, and the rest of SEA will contribute one representative team each. The last grand finals slot will be given to an invited team from China. Malaysian qualifiers will begin on 28 March, i.e. tomorrow; and will end on Sunday 29 March. The first day is a single elimination bracket, with each match being played as a best-of-one. The top 16 teams from the first day will move on to the group stage, where they will be joined by four seeded teams. The winner of each group will qualify for the grand finals which take place on 9-10 May 2015. All the qualifying matches are played online (at least for Malaysia), which makes it easier for teams to check in. Before registering, make sure to read the tournament rules to avoid any problems that could potentially arise over the course of the event. It should also be noted that registration is free for all teams.